In a Black Adder Baldrick-esk moment the soon to be pensioned off Governor of the Bank of England, Mervyn King announced his last cunning plan to help his bankster brethren by suggesting that all of the bad debts at the bankrupt tax payer bailed out RBS should be transferred to a tax payer owned bad bank (i.e. added to UK national debt) so that RBS can then be floated onto the stock market and that the politicians can thus announce that they made a profit for the tax payers. "The Government’s arms-length handling of the state-backed lender was a nonsense, and that it should use its 82pc stake to seize control and split RBS into a good bank and a bad bank." “We’ve not been sufficiently decisive in recapitalising or restructuring it,” he said. I.e. make £10 billion profit on the shares due to the fact that they have transferred about £100 billion of bad debts onto the tax payers (increase in national debt), so a net loss of £90 billion on what would amount to smoke and mirrors fraud. This is but the latest in along line of frauds perpetuated on tax payers that results in inflation, for when hundreds of billions is conjured out of thin air and handed over to the bankster's then that will cause inflation. The bottom line is that RBS went bankrupt in 2007 as soon as it's incompetent management bought ABN Ambro for £49 billion, following which it should have been closed down in an orderly manner and its assets restructured and sold by the receiver to the highest bidder. 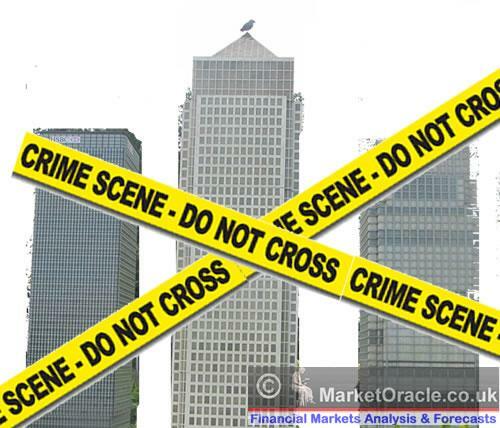 Instead the Bank of England stepped in to save it's bankster brethren to ensure this would not happen at unlimited liability to the tax payers that some 5 years later tax payers are STILL being forced to pay for the consequences of in the form of QE4Ever. This was the scheme of 2012 to steal wealth from savers to benefit the banks and debtors as the Bank of England's Funding for Lending Scheme that was announced in July 2012 sought to provide the Banks with cheap money to entice lending to the general public that will total an estimated of £80 billion over the 18 months of the scheme. The effect of which is that Banks are able to rely on Bank of England / UK Treasury funding for loans instead of Savings and thus savings interest rates have crashed as illustrated by the trend for Cash ISA rates at the tax payer bailed out HBos. Has funding for lending helped small businesses? The answer is NO, the only thing it is helped is bankster's declare bonuses on fictitious profits, as the loans books have continued to shrink as the banks run rings around the government in what amounts to fraud being effectively hard wired in the DNA of british banks. This is but the latest measure adopted by Government institutions to steal wealth from savers to benefit the banks and debtors. What this means is that when the funding for lending scheme ends in about 9 months time, it will either be extended or replaced by an even more fraudulent scheme. Apart from RBS bad debts being transferred to tax payers, the Bankster of England is already cooking up several other Baldrick-esk cunning plans such as Deputy Governor Paul Tucker's suggestion for Negative interest rates! Understand this FACT - The Government DOES NOT WANT YOU TO SAVE MONEY, They WILL DO WHATEVER IS NECESSARY TO FORCE YOU TO SPEND SAVINGS. The UK government as well as all western governments only know one thing which is to print debt and money to buy votes via the benefits culture and public sector that acts to consume the productive capacity of an economy, the consequences for which is inflation that far surpasses the deflation of technological advances. This is FRAUD. It is fraudulent to transfer the bad debts of banks such as RBS on to tax payers, It is fraudulent to print money and debase currencies so as to bribe voters. The bottom line is that the government and central bank's consistently push propaganda that there is no inflation or that inflation is low, when the truth is that the central banks CREATE Inflation and that the trend for Inflation is EXPONENTIAL. 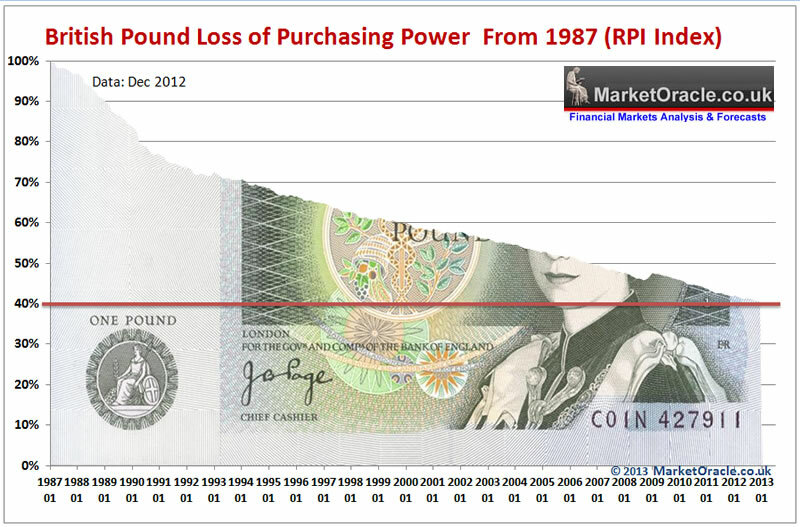 The above graph clearly illustrates an exponential trend that translates into a continuing erosion of purchasing power as illustrated by the fact that the pound in your pocket today is worth 40% of what it was 25 years ago which means you have to pay 2.5X the amount to buy similar good and services that you could 25 years ago where it is even worse for goods and services such as food and fuel where that pound is worth about 20% of what it was 25 years ago meaning you need X4 as much money to buy the same foods stuffs and energy that you could 25 years ago. Furthermore you are not exposed to one inflation rate but multiple rates of inflation such as inflation for food and energy tends to be higher than for consumer electronics as we all know that the technological development results in computers getting cheaper and faster each year which results in deflation for computing devices of between 5-10% whist food and energy inflation averages at between 6-10% per year. The importance here being that you only rarely buy a computer whereas you use food and energy EVERY DAY! 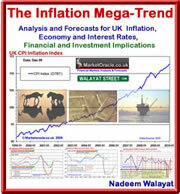 Therefore the official inflation indices are skewed towards under reporting real inflation as ordinary people tend to actually experience it in day to day life that over time exponentially under reports the true rate of inflation which is why the real rate of inflation that you have been actually exposed to over the past 25 years is probably triple that which is suggested by CPI. More on debt and inflation in my Inflation Mega-trend series of ebook's the newest of which is the Stocks Stealth Bull Market 2013 and Beyond (FREE DOWNLOAD).